Welcome to Mt. Lemmon, the wintery beacon atop a desert mountain that is actually considered to be the official highest point in the Santa Catalina Mountains. 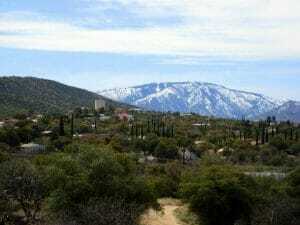 Within the Coronado National Forest, just North of Tucson, you will find this gorgeous snow-capped mountain with a summit elevation of an astoundingly high 9,159 feet. Follow in Sara Plummer Lemmon's (the first ascender of this mountain) footsteps, literally, and get some much-needed relief from the dry desert heat on this gorgeous mountain. To get to the summit of Mount Lemmon you can take Catalina Highway or the scenic byway, either one taking about 85 minutes to reach the very top from Tucson proper (though the scenery is so fantastic, we know you won’t regret the long drive). Learn the history of this mountain when you get here, the spot holding tales of lost mines, military bases, astronomy camps, and even Olympic skiers beginnings. If you choose to take the scenic byway you will see the upper reaches of the mountain range, unique rockscapes, forests, canyons, and deserts. The vistas are really unbeatable! You can head up to the Mount Lemmon Station Observatory, or former USAF Radar Base, and see the telescope-filled dome embedded with so much history. This spot actually used to be a top air defense strike zone, what is today known as the University of Arizona’s ‘skycenter’ once an important missile and radar base. If you’d rather see a different side of the mountain head up to Mt. Lemmon Ski Valley, a ski resort spot that started out with a humble group of skiers during the WWII days. Near the Visitor Center, you will also find a highly popular restaurant called the Iron Door Restaurant, a spot atop a fabled lost mine of Jesuit Padres from the 1700's. This spot serves up seriously delicious local staples and mountain delights, as does the patio cafe nearby called the Grub-Stake.